I live downtown and I love it. My car goes days without being used because I can walk to work. I have miles of safe and challenging routes to run right out side my door. I cross paths on a daily basis with movers, shakers and lawmakers in the capital city. I never have to worry about parking for festivals, events and baseball games and I must get at least a hundred free fireworks shows in my backyard every year. I have my pick of restaurants from the fresh, seasonal higher-end offerings at Central to the classic, affordable Chris’ Hotdogs. There’s one thing, though, that I’ve been praying for for since I moved downtown. Gyros. Ok two things, actually. Gyros and falafel. And then Zeus descended from Mount Gumpus and delivered to us NYC Gyro. Two months ago Syed Nawaz moved to Montgomery from lower Manhattan and brought the authentic Greek and Middle Eastern food he loved in New York with him. 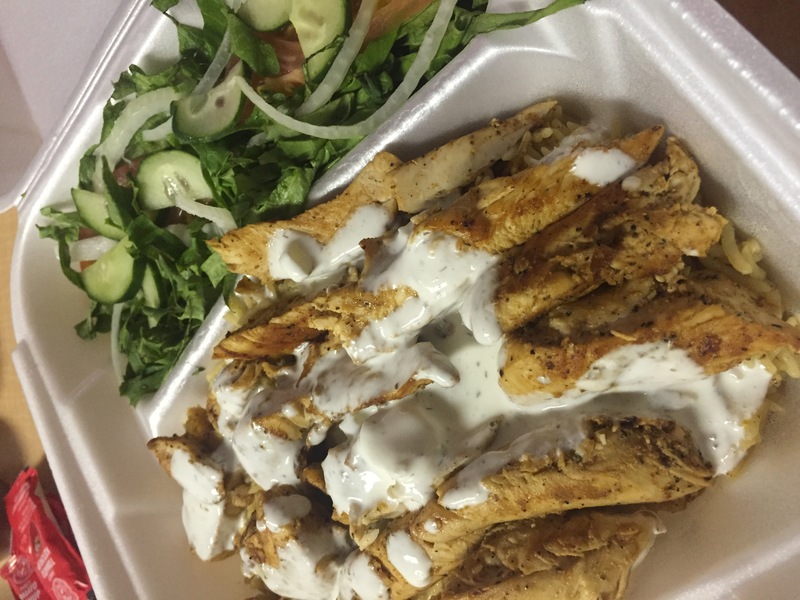 His brother Ali Syed, who already lived here with his wife Ruquayah, had the restaurant know-how and so they selected a small storefront at 15 Commerce Street to open NYC Gyro over the winter holidays. In New York, Syed was used to a huge supply of diverse, delicious, high quality foods, especially Middle Eastern cuisines, available at all hours. 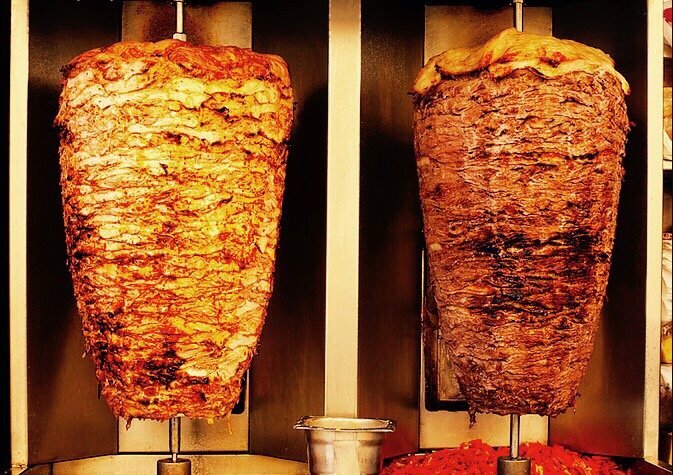 He knew that there weren’t any places to get truly authentic gyros prepared on and served from a spinning rotisserie here. He expected that between the hungry office workers and the tourists and locals in the Alley entertainment district that he could successfully bring that food culture he knew and loved to Montgomery. What he didn’t know was that Montgomery would be so receptive to the concept. “I was told that people here are not really open to new food and don’t change their habits, but that’s not true.” Syed said. He was taken by surprise at how groups like the Lunch in the Gump Facebook group and the EatMGM Facebook fans followed the opening, shared the menus and not only showed up but stuck around to talk to the staff and share what they liked and wanted to see on the menu. The authenticity of the food seems to have won the hearts of those who have already discovered NYC Gyro. Reviews on the restaurant’s Facebook, Yelp and Foodpanda pages gush about the quality and seasoning of the meat, the freshness of the vegetables and the generous portion sizes. The restaurant uses only organic veggies in the salads and sources a specific rice from Pakistan that they get from Atlanta and when unavailable, they have their family in New York ship it to them. Every plate is made to order too, insuring each meal is as fresh as possible. “I love Middle Eastern food and I want to let locals try food they haven’t had before… to bring the way I like to eat in New York here,” explained Syed. I’ve had a handful of meals from NYC Gyro and the experience has been consistently excellent. The first meal was a chicken gyro sandwich. I had the sandwich only with no sides. The pita was warm, soft and fresh with a good but not overwhelming flavor. 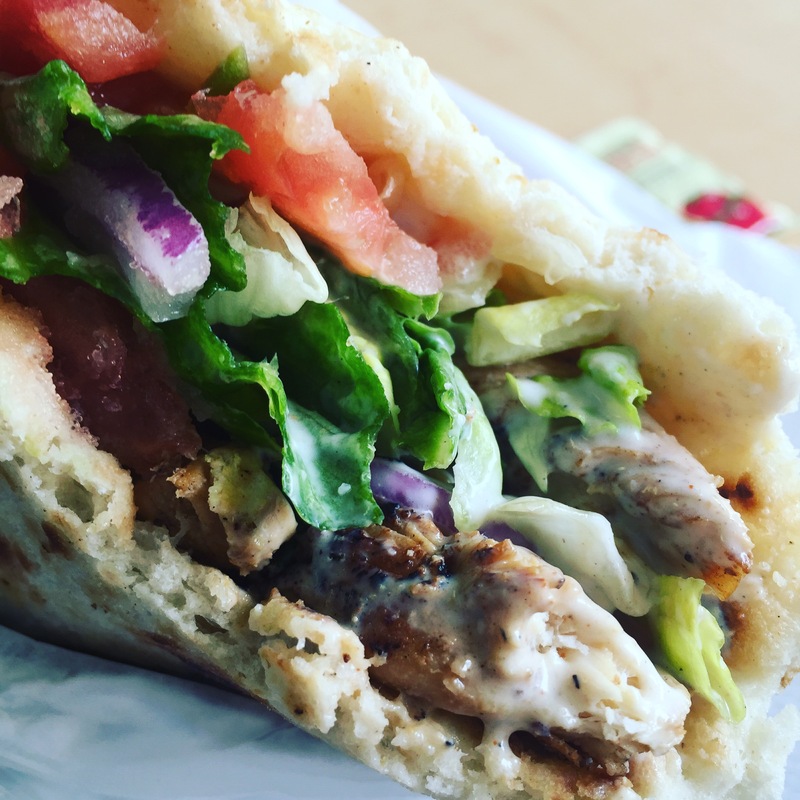 The sandwich was generously packed with warm slices of chicken gyro that had a great blend of garlic, cumin, thyme and other spices, none of which overwhelmed the palate. The meat was most and sliced in sizes that were easy to eat without falling out of the sandwich. The lettuce was fresh and chopped nicely with fresh tomato and onions and served with taziki sauce that was neither too sparse nor did it make the sandwich soggy. I finished my sandwich and felt full but not sluggish or weighed down by the meal. The next meal was a lamb gyro plate that comes with the rice and a salad. The rice has a wonderful flavor and the lamb was tender and moist, as was the chicken but with the delightful crispy edges that come from cooking on the rotisserie. The flavor was excellent and not gamey which some people fear in lamb. My most recent experience was with the falafel plate. I have to say I was surprised with the great flavor and texture. Too often falafel can be too dry or bitter from a tahini overdose. I found 5 or 6 light, fluffy balls of falafel and had a perfect amount of taziki to eat with them along with my hummus and salad. Each of these meals came in around $10 or less. You’ll also find a warm and welcoming staff that matches our southern expectations of hospitality. They brought their NYC speed and efficiency with them, too, when you consider that each plate is made to order comes out in about 5-10 minutes when they are not very busy and within 10-15 during a lunch rush. You’ll also be offered fresh hot sauces and sides if you like which is a lovely touch. Hours – M-Thurs 11 a.m. – 9 p.m.; Fri 11 – 3 a.m.; Sat noon – 2 a.m.; Sun noon – 5 p.m. The Philly Cheesesteak. 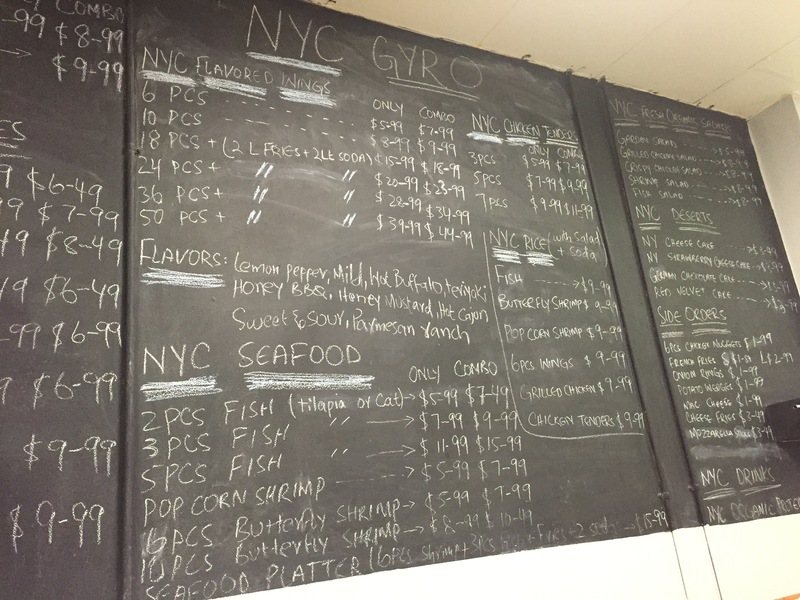 This place is called NYC Gyro, but there’s a ton of items on the menu that like NYC, are all-American. Flavored wings, burgers, cheese fries, chicken tenders and a Philly Cheesesteak that co-owner Ali Syed says everyone who has tried says is the one of they best they’ve had. An authentic Philly Cheesesteak is another rare offering in Montgomery, so this is worth checking out! Meg Lewis is a runner and cupcake baker who lives the loft life in Downtown Montgomery. She regularly makes her rounds through downtown and midtown Montgomery evaluating the beer selections, live musical performances and the social atmosphere of local establishments in the company of a small and close-knit group of fabulous people. The owner friended me on FB so I asked the him if they had a rotisserie like device and he said no. I just don’t understand why he uses that same image of the rotisserie that you used. Seems a bit misleading to me. I would ask him yourself to make sure since you are stating he does use a rotisserie. The frozen hunk of “lamb” he uses isn’t my fav either but i can get past that.